Robert Calvert - "Rehearsals 1987: Radio Egypt" / "Middlesborough 1986: The Right Stuff" / "Cardiff 1988: Ejection" / "Manchester 1986: In Vitro Breed"
All of these CDs were released as part of a series of Robert Calvert rare live recordings. All of them are taken from cassette tape recordings from the audience so the quality is quite variable and sometimes not all that good at all. These are meant for the true Calvert fans. Quite a few Hawkwind songs are performed. The best thing about the live CDs is that often Bob is in quite a good and very talkative mood and says some very funny or relevant political commentary. Let's start with the rehearsals. The CD is not tracked well as there are 16 tracks listed but only 11 tracks on the CD. Pretty decent sound but the drums and vocals are not very clear, though you get to hear the band rehearsing and some of these songs did not actually enter into the live set. So it is cool to hear stuff like (Only) the Dead Dreams of the Cold War Kid, Aerospace Age Inferno, Sprit of the Age and Ejection. The CD ends with a very funny blue version of Silver Machine, which I have never heard before! Cool. You hear a lot of the rehearsal banter in between tracks as well. The Middlesborough 86 show is the worst sounding of all the shows but Calvert is really funny and brilliant at this show. All the songs on this CD are also on the Manchester 1986 double CD (it says it was recorded in October 1987 in the liner notes!) The Manchester show features the Hawkwind tracks Quark Strangeness and Charm, Paranoia into Ejection, Spirit of the Age and Sonic Attack, so the majority of the double CD is a good selection of solo stuff. There are quite a lot of interesting tracks on this double CD. 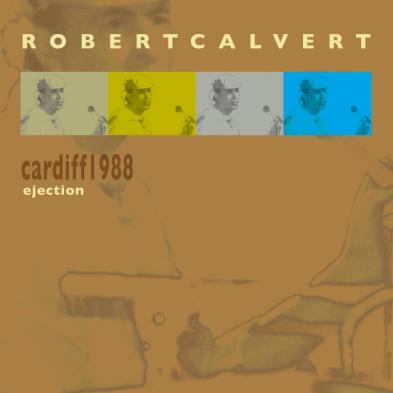 Calvert had quite a lot of political songs in his bag at this time and played songs from Test Tube Conceived as well. The Cardiff show was one of the last ever by Calvert and it was probably released because of that as there are some flaws on the tape and the sound is less than great. You get 18 tracks, most of which were on the Rehearsals 1987 CD but Bob is in good spirits and performs excellent. Overall, if you were a big fan of the works of Bob Calvert then some of these are worth picking up for sure, and if you saw the man live in concert at this time you are sure to revive some cool memories. These are mostly for the collector and I think they are only printed in 1000 copies.